The best acoustic guitars under $500 for 2019 - reviewed! 2019 has been a competitive year once again for the best acoustic guitar under $500. We have selected six acoustic guitars which were mostly released in 2019 and have been making waves in the industry for their sound and their value for money. We kept our selection to well-respected brands that come with solid guarantees and assurances about quality and we think you will agree with us on that one too, so please enjoy our selection of the best acoustic guitars under $500 in 2019. 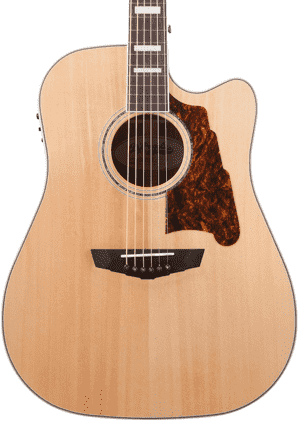 Seagull S6 Original Acoustic Guitar The S6 is a great instrument for those looking for an entry-level yet high-quality acoustic guitar and is made of with wild cherry back and sides with a solid cedar top. This guitar is surprisingly made in Canada and remains to be Seagull’s best selling acoustic guitar. Definitely worth considering. Ibanez AEWC400 Acoustic-Electric Guitar This fantastic looking glossy guitar with the Ibanez specially contoured edges and slimmer body all provide total comfort to the player. This is a real contender for the best acoustic guitar for 2018 with its total attention to detail and amazing sound and Fishman pick-up. D’Angelico Premier Bowery Acoustic Electric Guitar Another heavyweight brand producing another heavyweight acoustic guitar for 2018. The Bowery really won’t let the player down in terms of performance and sound. With a solid sitka spruce top and rosewood laminate back and sides as well as an industry standard Fishman pick-up, it really does feel like D’Angelico have exceeded all expectations once again. 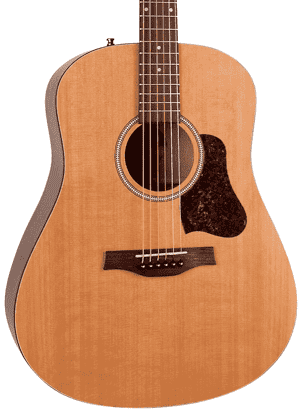 Guild D-240E Acoustic-Electric Guitar This Guild acoustic guitar falls $100 shy of our target price of $500 for most retailers but, boy, does it pack a punch in terms of performance and quality of sound. 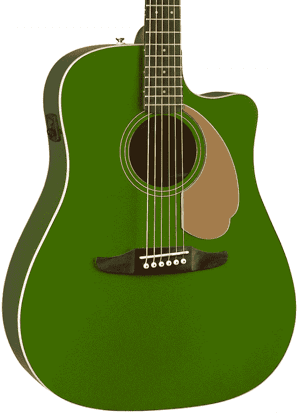 This acoustic guitar creates a solid warm tone and is extremely comfortable to play. Not new for 2018 but and outstanding acoustic guitar nonetheless. The new Fender California Series Player comes in three different sizes: Newporter, Redondo and Malibu. Newporter is a grand concert size. Redondo is a dreadnaught with a cutaway. Malibu is a smaller version of a dreadnaught (not quite a parlor but similar in size). One of the key features to this range is the huge array of colors on offer from Fender with equally fetching names such as rustic copper to champagne and aqua splash. Despite being originally released in the 1960’s, the California Series is very much a brand new modern acoustic guitar and sounds absolutely superb complete with a mohagany neck and the industry standard Fishman pick-up. The Fender California series comes with a Strat headstock which some may think looks cool and others, more traditional acoustic guitar players may find irritating. The MRRP for the Fender California Series Player is $399.99 which comes in at a cool $100 under our $500 target range, so this is an absolute bargain and ideal for someone just starting out who wants a big brand that actually carries some weight in the industry. 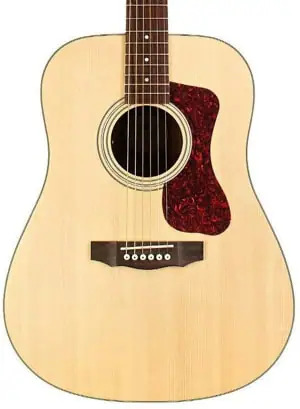 Not a new acoustic guitar for 2019 by all means but a consistent and quality acoustic guitar from Seagull and practically considered their standard entry level guitar which happens to be also a great choice for intermediate players too. The Seagull Original comes in a single dreadnought-style shape so has a large booming sound to it. As far as construction goes, this guitar is second-to-none at this price range. It has wild cherry back and sides with a solid cedar top allowing it to age brilliantly over time and have a popping sound. It also comes with a rosewood fretboard and has a satin finish. These guitars are surprisingly made in one of the many Seagull workshops in Canada and still come in at great value for money. This acoustic guitar falls well short of our $500 mark with an MRRP of $399 putting it at exactly the same price as the Fender California Series Player but without the Fishman pickup. This is a great option and is Seagull’s best selling guitar by a long margin. This incredible acoustic guitar has been designed completely with comfort and playability in mind. It comes as a Grand Concert or 00 size guitar, so more comfortable to hold than a dreadnought. It has a great cutaway, giving the player full access to the higher part of the fretboard. It comes in flame maple top, back and sides with an amazing gloss finish. The neck is made of tropical mahogany with a rosewood fingerboard. One of the amazing features of this acoustic guitar is the construction where Ibanez have managed to curve the wood at the edges to give it a cool and awesome looking finish. You’ll also find an industry standard Fishman pickup and Ibanez pre-amp built in for those wishing to plug it in and belt out those chords. These acoustic guitars are made in China like most acoustics in this price range. This is definitely one fantastic guitar worth considering to impressive your friends and gets a two thumbs up from us! This is a superb option at this price point with an MRRP of just under the $500 mark at $499. The Bowery comes in the classic dreadnought body style and has the industry standard Fishman pickup/preamp for those looking to hook it up to an amp. It has a mahogany neck with a solid sitka spruce top and rosewood laminate back and sides giving it a sensational sound. It has the standard striking D’Angelico headstock which looks fantastic and holds its tune really well. D’Angelico is a world-renowned guitar brand and was founded back in the 1930’s by John Angelico in New York who was one of the most famed luthiers of his day. The brand continues with the same ethos and standards as John had back then. Not new for 2019 but a Guild classic definitely worth considering for under $500 and even under $400 from some vendors. This is a sensational acoustic guitar from Guild and has been a great seller for them. It comes in a dreadnought size with a solid spruce top and mahogany neck, back and sides as well as pearloid dot inlays on the rosewood fingerboard giving it a great look. It has an arched back and side which is a style Guild is renowned for giving it a great warm and sustained tone. 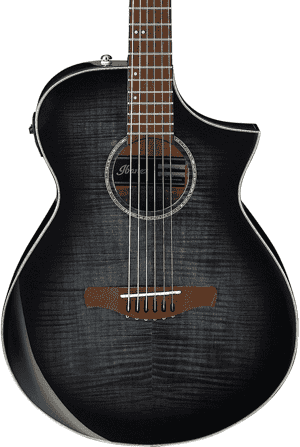 This is a fantastic acoustic guitar at this price range and keeps its tune brilliantly. It has had consistently great reviews and can hold its own against guitars priced even higher. It also ships with a gig-bag so what more do you want? A great option from well under the $500 from a well-respected brand. Many people wonder if it’s possible to have a great acoustic guitar below $500. This list shows that yes, it is definitely possible to have a genuinely awesome instrument at a fraction of the price of of high-end acoustic guitars. We’ve got to thank guitar companies for finding ways to keep costs down while retaining instrument quality. At the $300-$500 price range, you can find guitars that are made from decent tonewoods and components. The guitars in this price range may not have the handcrafted bodies and necks of more expensive guitars but that doesn’t mean they don’t sound and play well. Makers of these awesome acoustic guitars under $500 pay a little more attention to detail while doing their best to balance things out in terms of cost and quality. With these guitars, you’ll be able to avoid, or at least easily fix, some of the common problems associated with guitars that are too cheaply made. We’ve selected the guitars here not only because of their price but also because of how they don’t give players those annoying problems, such as a tone that leaves much to be desired. Going out of tune easily – Some budget guitars have poor-quality tuning mechanisms that cause the guitar strings to go slack or go out of tune often. You will most likely end up having to replace the tuners along with the strings. The models in this list of acoustic guitars under $500 are equipped with good tuning machines that make tuning easier and keep each string in tune. High action – A high action keeps the guitar from being comfortable to play because the strings are too far away from the fretboard. This means you will have to exert more effort and pressure to fret the notes. You will have to have the action adjusted to a more comfortable level to make the guitar more playable. Sharp or uneven fret ends – Razor-sharp frets and uneven fret ends can slice your fingers. Sharp frets can be caused by exposure to low humidity, but if they’re on a new guitar, it’s most likely due to poor workmanship. It’s unlikely that the factory where the low-end guitars are made didn’t file the fret ends properly, if the facility files them at all. Cracks on the soundboard, back and sides – exposure to extreme changes in temperature and humidity can cause the wood of the acoustic guitar to crack. Falling from a height or getting bumped into something hard can also cause cracks on the wood of an acoustic guitar. Acoustic guitars that are made too cheaply are made from materials that make them more vulnerable to cracks on the body of the guitar. This isn’t the case with the guitars on this list, which are more sturdy and resilient because of the use of better-quality materials in their construction. Skewed or warped neck – Low-grade materials and poor workmanship can also be blamed for a guitar having a weak neck that can cause it to become skewed, bowed, twisted or warped easily. If there are issues in the neck of a guitar, you may never get it to play right. You’ll have a lot of fret buzz and difficulty in playing the guitar and keeping it in tune. The guitars on this list are great for beginners and intermediate players alike who are looking for an acoustic guitar that is not so expensive yet not on the lowest end of the price spectrum either. If you don’t mind the use of laminates or less expensive tonewoods and components in your guitar and are looking for something with excellent sound quality and value for money, consider choosing from the models we’ve listed here.